How to set up your projector and get the best picture | What Hi-Fi? Whether you want a good deal on Full HD or a cutting-edge 4K HDR beamer, we walk you through the specs and set-up of the best projectors you can buy. While the flickering film reel is a thing of the past, a good projector can turn any room into a little slice of home cinema heaven. But with so many to choose from, each with its own complexities, it can be difficult deciding which is best for you. So sit comfortably and grab some popcorn - we’ll guide you through it. What kind of projector should you get? Let’s start by breaking down the different kinds of projector. Most will be one of two varieties: DLP (Digital Light Processor) and LCD (Liquid Crystal Display). LCD projectors use three liquid crystal displays – each of which handles a primary colour – to project three images tinted red, green, and blue. These images are then recombined in a glass prism to show the full colour spectrum, before being beamed onto the big screen. A DLP projector uses a single chip made up of millions of microscopic mirrors. Each individual mirror can be angled, thus directing light towards the screen or directing the light from it, with each mirror effectively working like a pixel in a television. A spinning colour wheel sits in front of the light source and determines what colour is shown. There’s also LCoS, which stands for “Liquid crystal on silicon”, and works similarly to DLP – but instead of mirrors, it uses liquid crystals to control the light. Both Sony and JVC use this technology, under the names of SXRD and D-ILA respectively. All of these technologies have their benefits and drawbacks. DLP projectors are generally brighter and sharper, but can suffer from a ‘rainbow effect’ (where you can see the individual red, green, and blue colours) if the panels aren’t perfectly aligned. LCD projectors are usually cheaper and don’t suffer from the rainbow effect but can, in some instances, struggle with motion. LCoS, meanwhile, don’t suffer the rainbow effects DLP projectors do and aren’t prone to screen burn-in like LCD projectors. On the other hand, their black levels usually aren’t as good and they tend to be bulkier, pricier devices. While each projection technology is different, don’t let that be the be-all and end-all when looking for a new projector. Your best bet is checking out reviews of the projector you want to buy before making any decisions. 4K or Full HD: What resolution should you get? While buying a HD television nowadays is a little passé, a Full HD projector is still a good choice - especially if you want to try and keep costs down. There are a number of good choices, but our favourite at the budget end remains the £600 Epson EH-TW5350. But if your budget can stretch to it, there are a number of ways of getting an Ultra HD 4K picture (which is four times the resolution of HD). Newer projectors (which hit the £2000-and-under price tag) often come with Texas Instrument DLP chips. These aren’t natively 4K, but rather have resolutions of 4.15 million pixels – half that of Ultra HD’s 8 million. Through a form of pixel shifting, which rapidly fires two lower-resolution images at the screen to create a higher resolution image, the projectors can call themselves 4K– and get certification from the Consumer Technology Association (CTA) in the USA. Right at the top of the price range, meanwhile, are native 4K projectors. These can cost anywhere from £4500 onwards, but come with the peace of mind that your picture is as naturally, natively sharp as it can be. The best ever picture we’ve laid our eyes upon has been from the superb JVC DLA-Z1 - but it does cost an eye-watering £35,000. Ultimately, price and projector size will be the two factors that decide what resolution you get – it’s just a matter of picking the best one. Can I get HDR too? These days you’d be mad to have a 4K TV without HDR (High Dynamic Range). With projectors, it’s trickier and less common. Most of the time, HD projectors won’t come with HDR support. Many lower-cost 4K projectors are capable of accepting a HDR10 (the standard version of HDR) picture from your Blu-rays or streaming services, but cannot recreate the full range of colours. BenQ's W1700, for example, is ‘supercharged by HDR10 support’ according to the company, but only puts across 96% of the Rec.709 colour range. The five-star Optoma UHD40 does much the same thing. 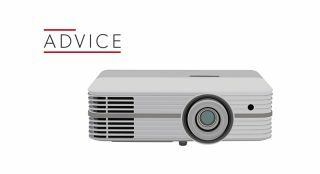 While accepting a HDR signal is certainly better than not accepting one, you can get true HDR from a projector – you just have to pay significantly more for the feature. The Award-winning £5200 Sony VPL-VW260ES is a good starting point for a proper HDR10 picture, and the more you spend the better a picture you’ll get. 3D in TVs may have fallen from fashion for TVs, but it remains prominent in the projector space. Portable projectors from as little as £300 will support the third dimension, so your 3D Blu-ray collection can still be enjoyed. Whether big or small, setting up the projector properly is vital. One of the first things you’ll want to consider is the throw ratio: that’s how far the projector needs to be from the screen to get a particular image size. You can work this out by looking at your projector’s manual (or, usually, on the manufacturer’s website). It looks like a number, followed by a colon, and then another number. For example, if the number is “1.15:1”, then for a one-metre wide picture your projector needs to be 1.15 metres back, for two metres it's 2.3 metres back, and so on. While most projectors are ‘long-throw’, so they need to be relatively far from the screen, others are ‘short-throw’ and can be positioned quite close to the wall and still project a large image. Whether you want a short-throw or long-throw projector should be taken into consideration before buying – it’s a lot easier to buy a different projector than it is to buy a new home cinema room! You’ll also want to consider getting a projection screen. In fact, we’d go so far as to say a screen is vital if you want the best out of your new projector. While you can certainly use a blank wall if you want to, projection screens are specifically designed to be more reflective, so you can get a sharper, more colourful picture using one instead of your standard wall. Also, having a solid black frame around your video that the screen provides can significantly improve contrast levels. Positioning is equally important: ideally, you want the projector level with the middle of the screen so you get as little distortion as possible. It’s always best to put the projector on a flat surface, but most units come with adjustable feet to help with levelling. If you have to use the legs, you should hold the projector in place and then unscrew the legs (to make them longer) until the image is level. At this point, you should be close to getting your projected image to its ideal state. Many projectors will also have dials (or more expensive projectors might have electronic controls on their remotes) to zoom the picture in or out so you can make it fit your screen. If you’ve had to place your projector up high (or too low) so the picture ends up looking skewed or angled oddly – e.g. it looks more like a trapezoid than a rectangle – you can deploy keystone corrections. Keystone stretches out the picture (either horizontally or vertically where needed) so you get a perfectly rectangular output on the screen. It can be useful - but extra scaling affects image quality, so it should only be used as a last resort. When setting up a projector, you want as little distortion as possible for the best image. Once you’ve done that, you can adjust for focus. The best way to do this is to get your projector projecting some words – the end credits of any movie are a good choice – and while you sit by the projector your friend stands by the image so they can see the pixels. Slowly adjust the focus back and forth until it’s as sharp as can be, with your friend giving you guidance on whether the pixels are blurry or not. Some projectors may require you to push up the sharpness by an increment or two, but be careful it doesn’t go too far and result in making the picture over-edgy. Most often than not a projector’s settings will be factory default, but we’d recommend starting with either 'standard' or 'cinema' presets and then adjust brightness and contrast from there. Have a couple of good films at hand to play when tweaking your picture, too. For contrast, pause on a scene with fluffy clouds: crank up the contrast to the top, and then turn it down incrementally until you start to see the detail rather than just a white blob. When it comes to brightness choose something dark, like an overcoat or jacket, and keep going as low as possible until start to lose insight in the creases and folds. You might not need to do much to the colour controls, but if you do then you should stick on a brightly coloured scene and push the controls up if you think they need more punch, or down if they’re overblown. A scene with human faces will also be a good measure of skin tones. Also, while an Eco mode can be good for keeping the projector’s fan quiet, it will also negatively impact the punchiness of the picture. Most projectors have one, so it’s worth digging into the settings and turning it off. Once you’re all set up, we would recommend pairing your projector with a capable AV receiver and suitable sound system. While many projectors come with speakers built in, they’re usually small tinny ones that are – at times - worse than cheap Bluetooth speakers. You’ll get a much better performance from a dedicated 5.1 speaker package. Then get a good source - any of our five-star rated Blu-ray players will go down a treat - and you can watch all the latest 4K Blu-ray discs in full cinematic glory. Happy viewing!